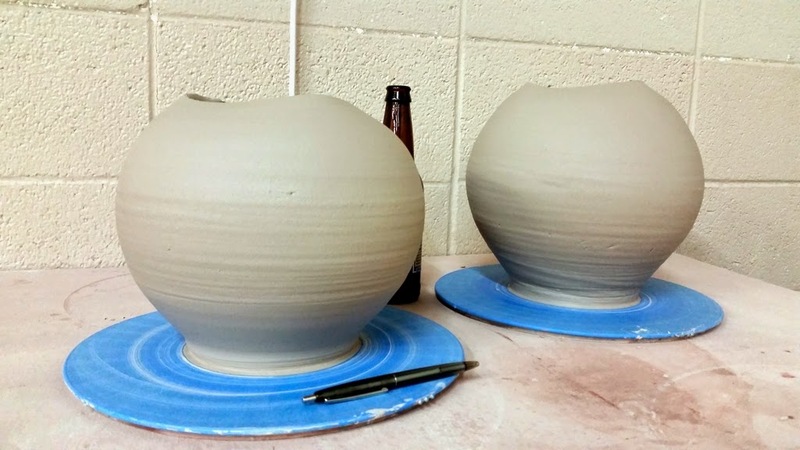 Saturday I went to Clayworks and threw two very round pots. I like it when the pot is very round and the opening becomes triangular as it's a nice combination. I will glaze these with some nice shino and they'll be warm and rich. 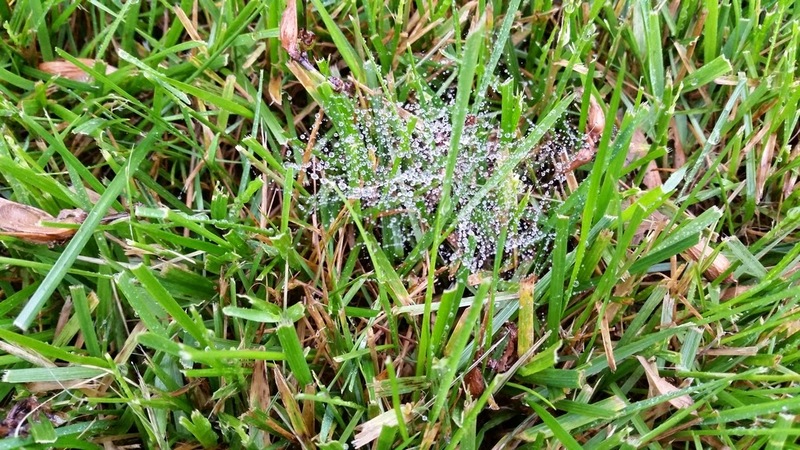 It rained on and off during the day and while I was out in the yard with the dog I noticed a spider web with rain droplets on it. Pretty nice, even with just the cell phone camera. It can be easy to overlook. Thursday I checked out how the plants are doing in the back yard. 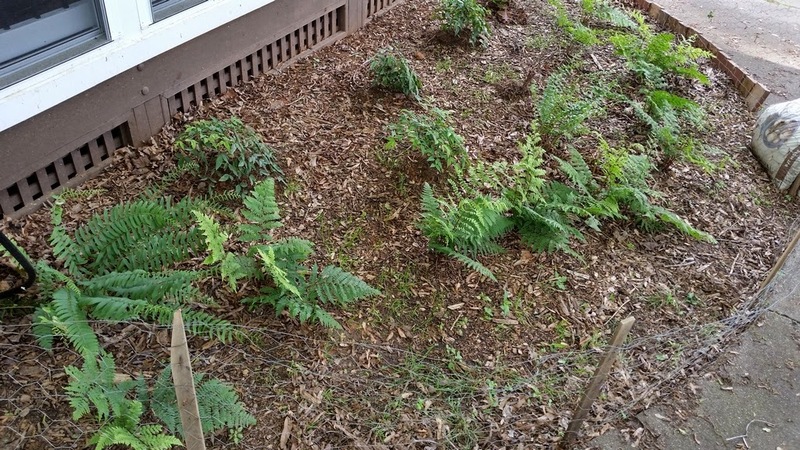 I'm glad to see that the ferns and others are doing very well. 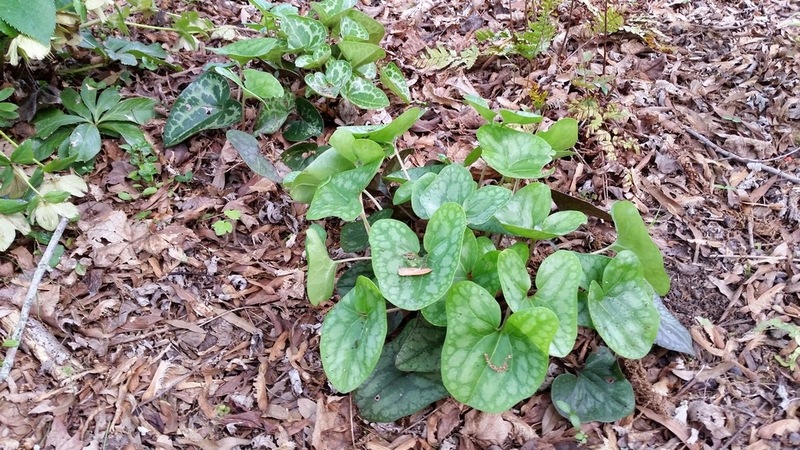 Native plants have their advantages. 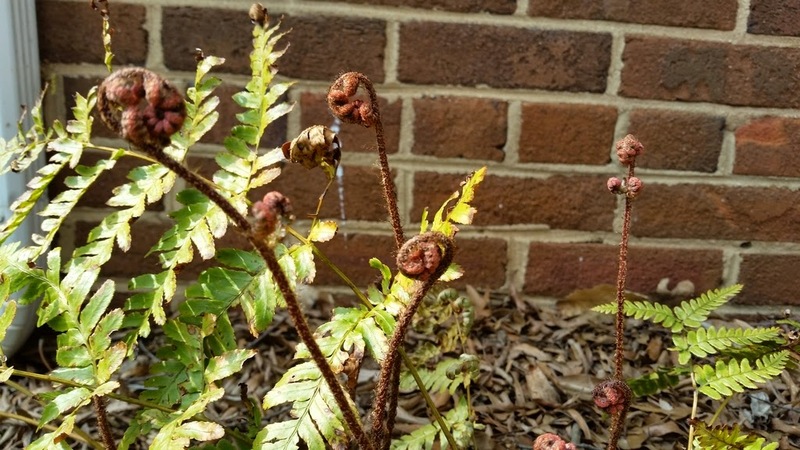 Christmas and lady ferns by the porch. Christmas and lady ferns on the hill. at this time of year after a whole winter. 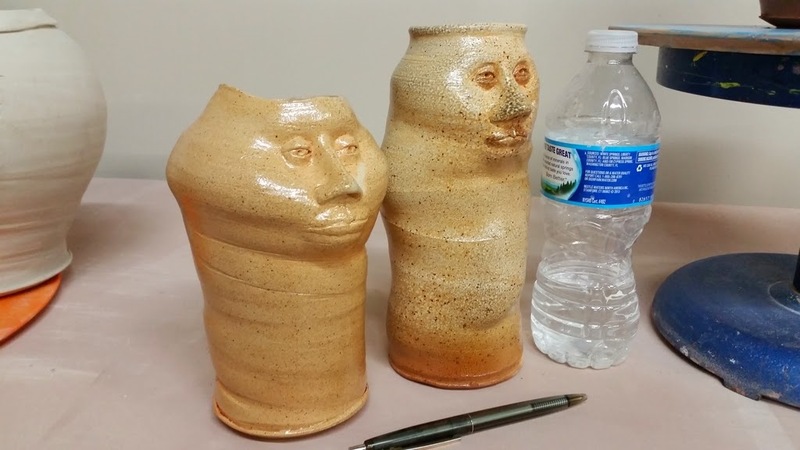 The brown jugs are thriving. 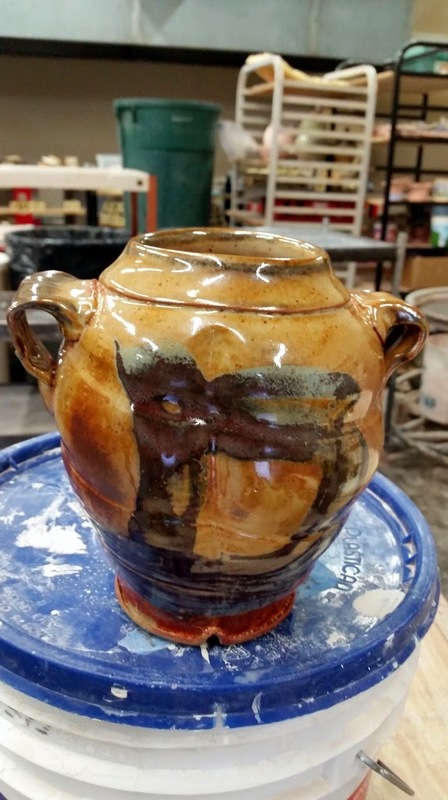 Thursday night I went to Clayworks and made a pot that I applied thick slip onto with a flexible rib. This could be fun since I have some ideas on the glazing. Ha, bet you thought I was going to say "apple sauce". Wednesday I made pork chops, green beans, and potatoes, that I got from the newspaper. 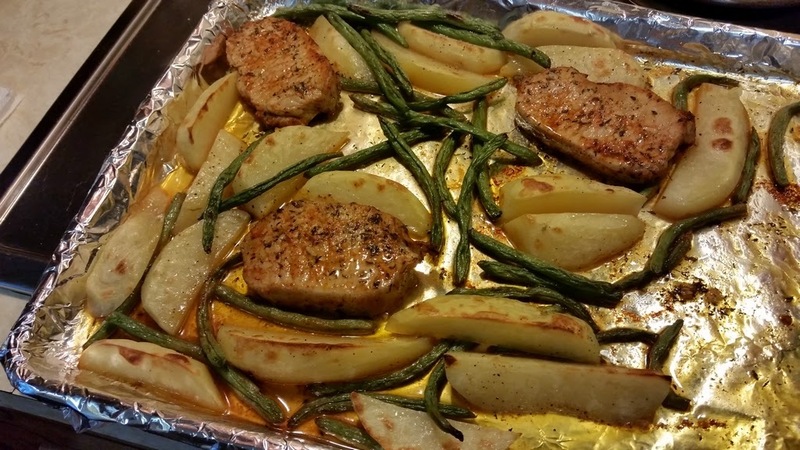 It's a one baking sheet meal which makes cooking it and cleaning it up easy. I'm all for that and it tastes really good, too. Later on I went to Clayworks. 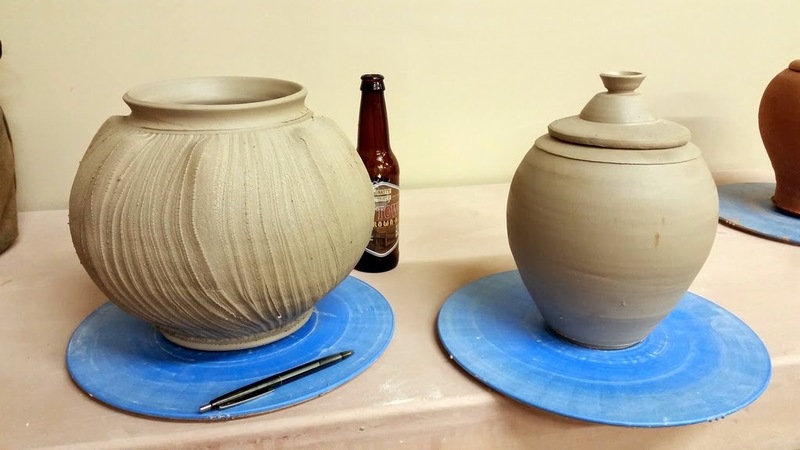 I finished the lid for the lidded pot and made a garlic pot. 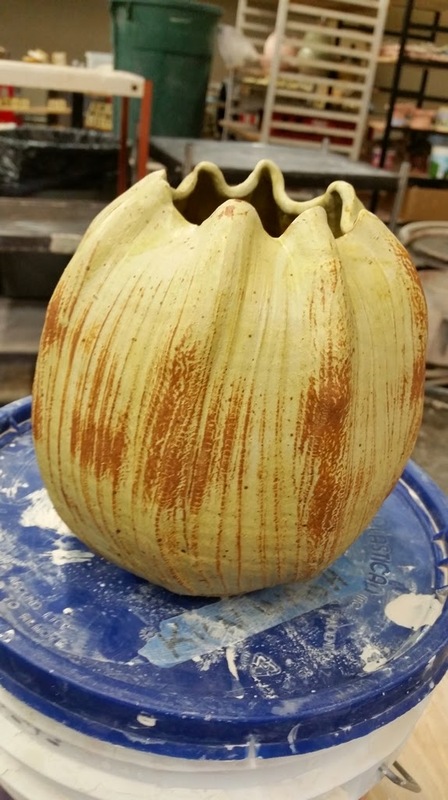 I still enjoy making the garlic series so I will continue with them in different forms, clay bodies, and glaze combinations. Tuesday was my father-in-law's birthday. He turned 86 and we all wish him the best and many more. 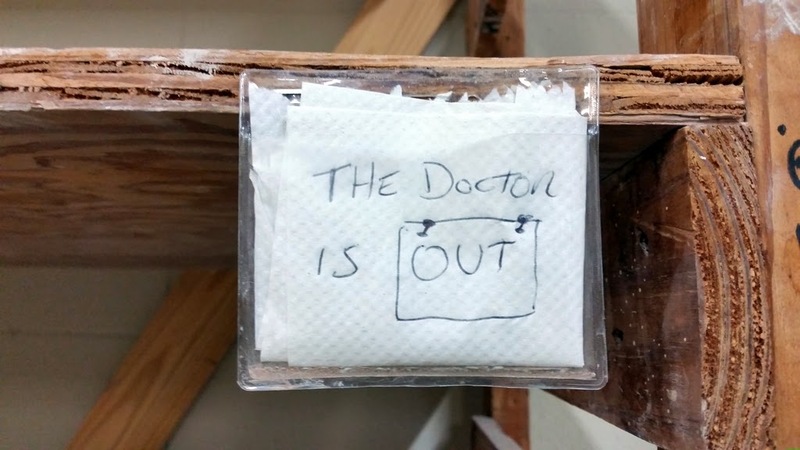 I pulled this photo from my sister-in-law's Facebook post since they are in PA. We were there in spirit, anyway. 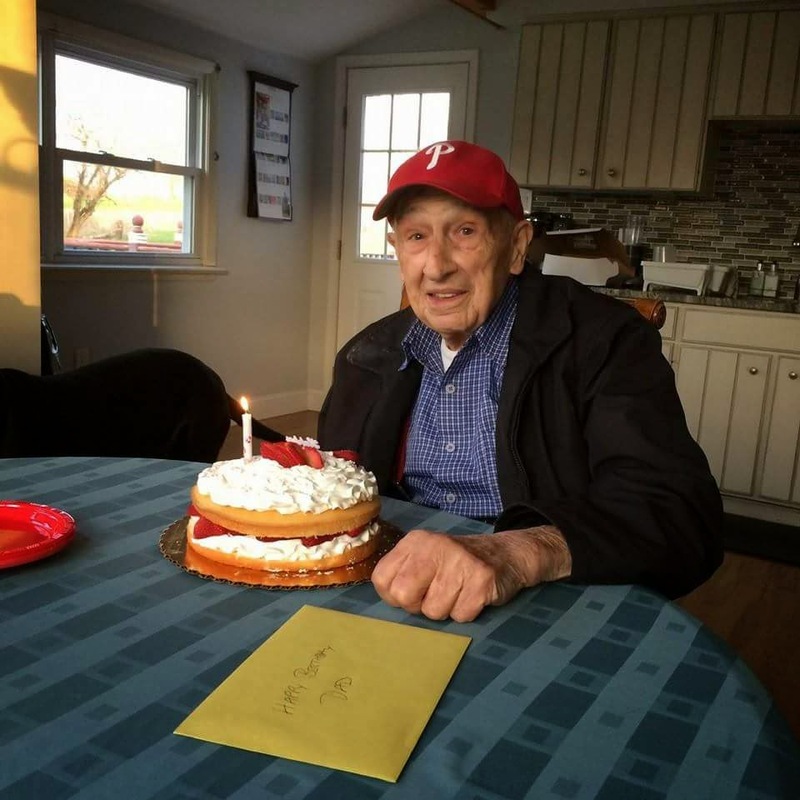 John Pellow on his 86th birthday. 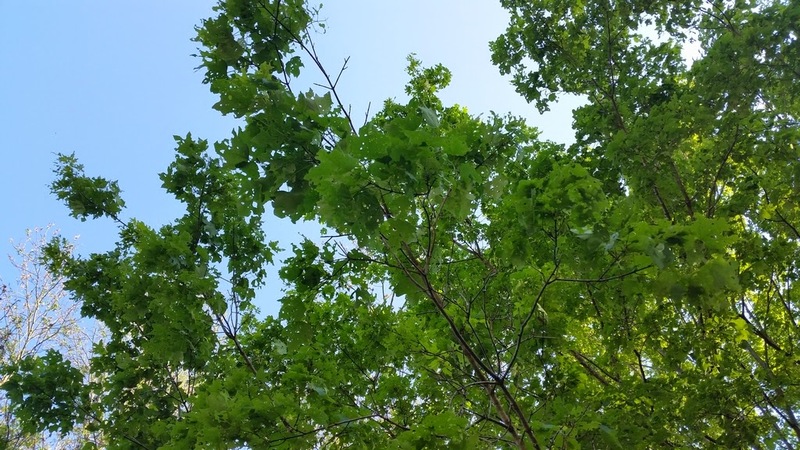 The cankerworms have done a number on our maple trees. The leaves look like doilies and I hope the tree can recover. I've got to remember to band the trees in the fall. 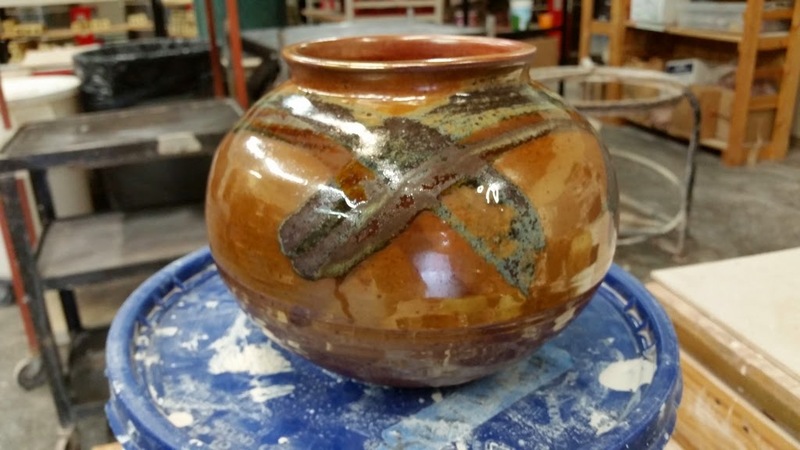 I went to Clayworks and made a lidded pot. 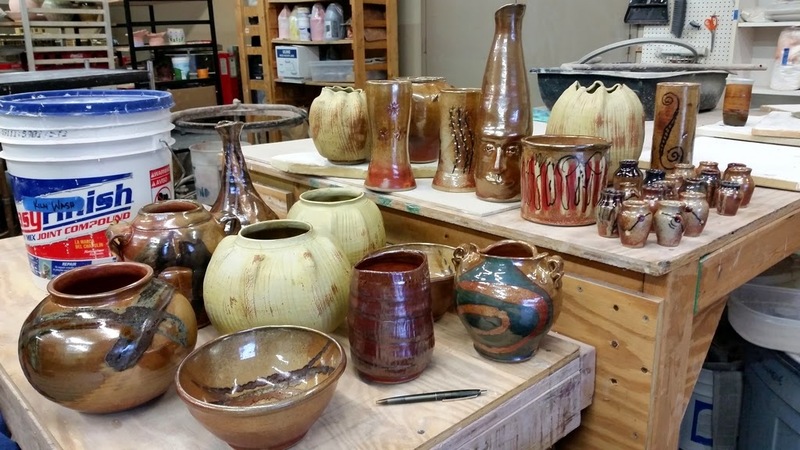 Sunday I went to Clayworks to work on some pots. 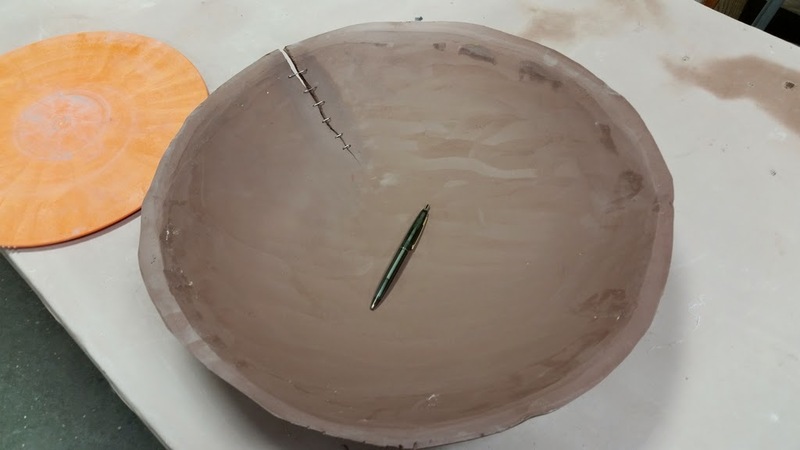 For the Clayworks Spring Sale & Open House the studio artists each did their own version of a large bowl form from the same slump mold. I ran out of time getting mine done but I am still working on it. More to come on that. 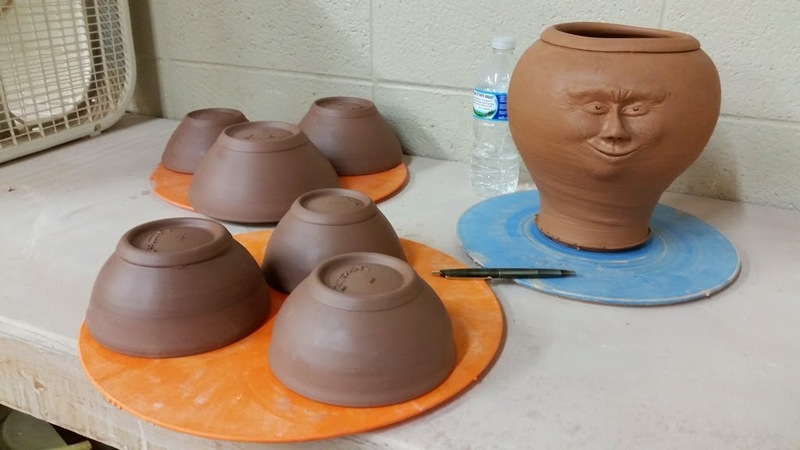 I trimmed up some smaller bowls and put a face on another pot. He looks pretty sly. 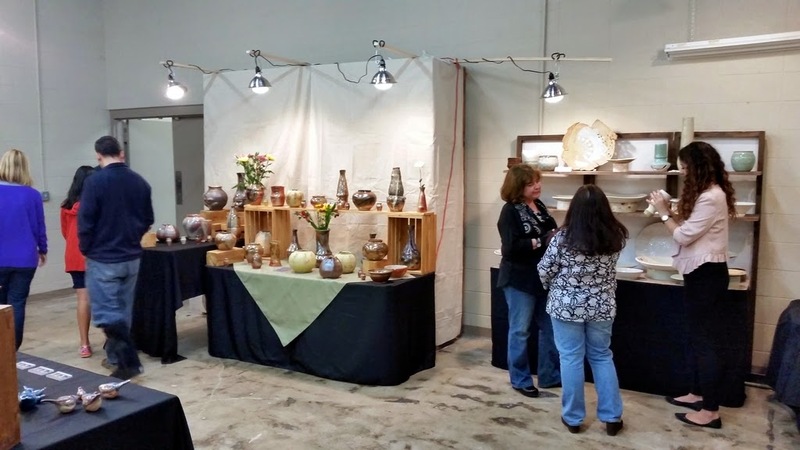 Friday night we had a good crowd of people attend the Clayworks Annual Spring Sale & Open House. There was a steady stream of people through the studio. 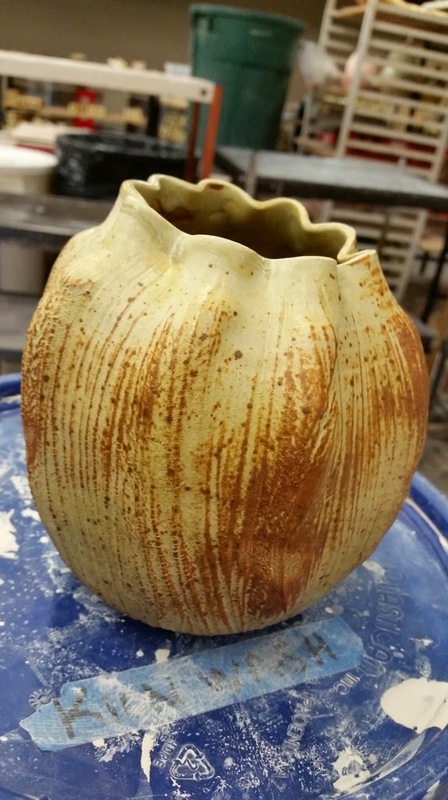 I had lots of conversations about my process and several of my pots found new homes that night. It's in no way a competition, but it gave me a good feeling when I was selling some of my work next to artists that I respect and admire. 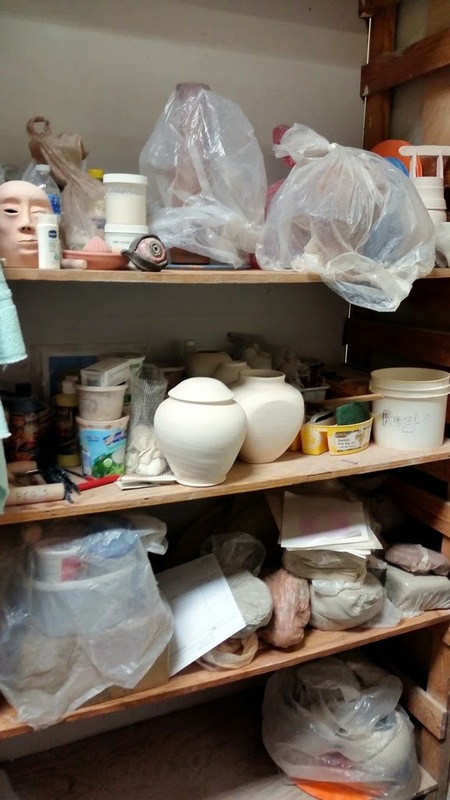 It made me feel more at ease in my new place at Clayworks. Thanks to everyone who came out to the sale and thanks to all my friends at Clayworks who made me feel welcome. Friday morning Karen asked me to slice an apple for her to take to work. 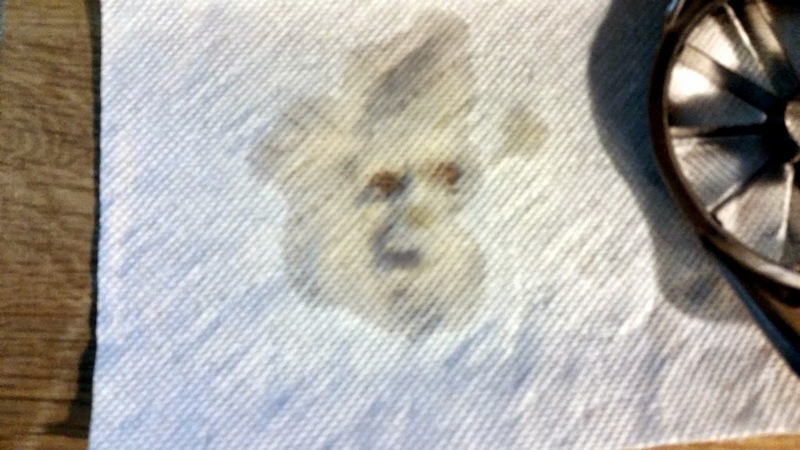 I did and afterwards I noticed that the mark from the water on the paper towel looked remarkably like a face. I always try to keep my eyes open for interesting things and this one was not subtle. 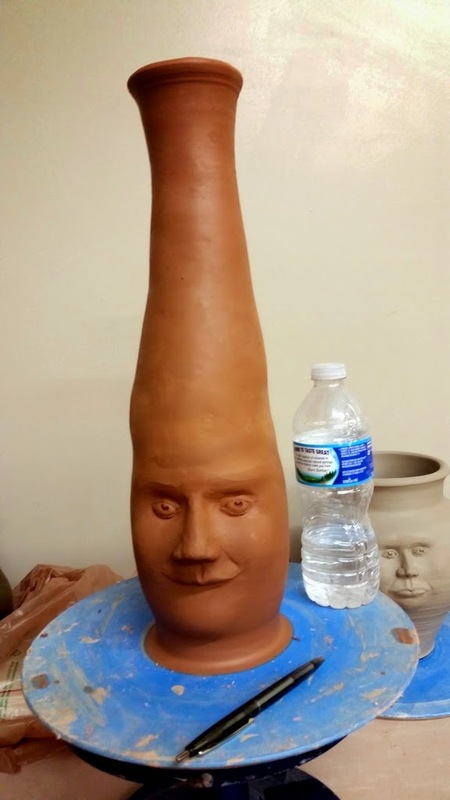 Maybe a new face for a pot. 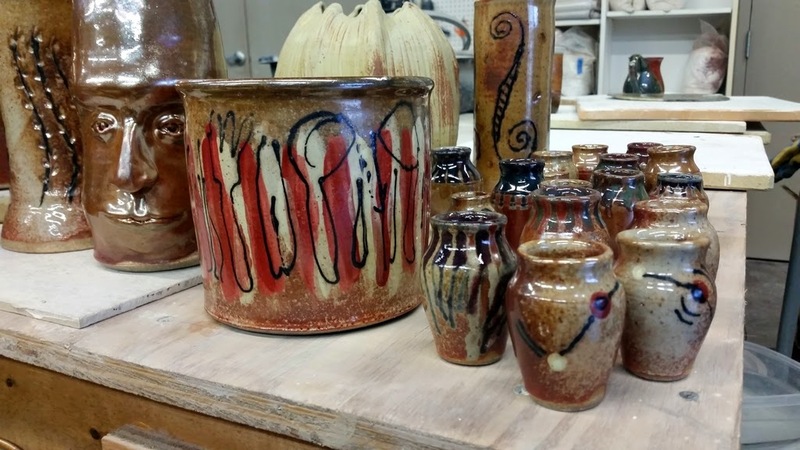 On Thursday afternoon I went to Clayworks to set up for the Annual Spring Sale & Open House. It was exciting since it was the first one in which I was participating. 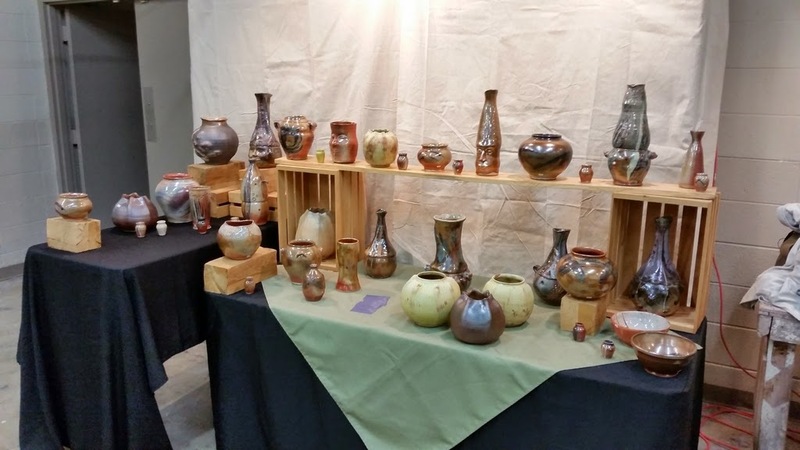 In the past when I was a student I would volunteer to do throwing demos for the sale, but this time as a studio artist I had a table to display my work. 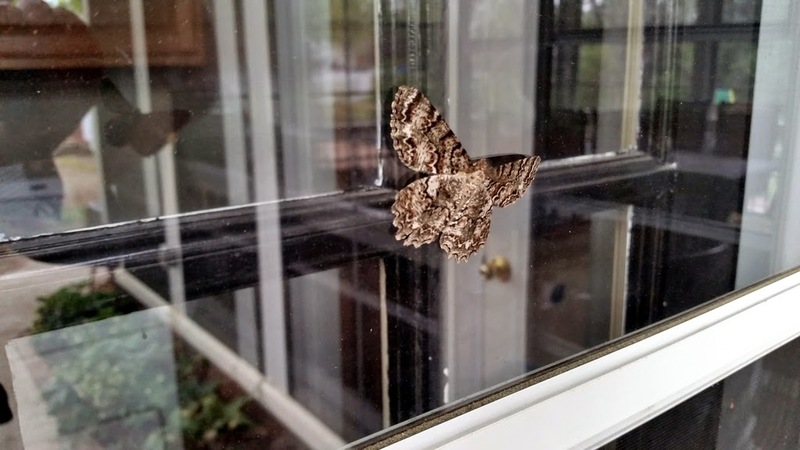 Monday I found a large moth on the storm door when I was leaving the house. 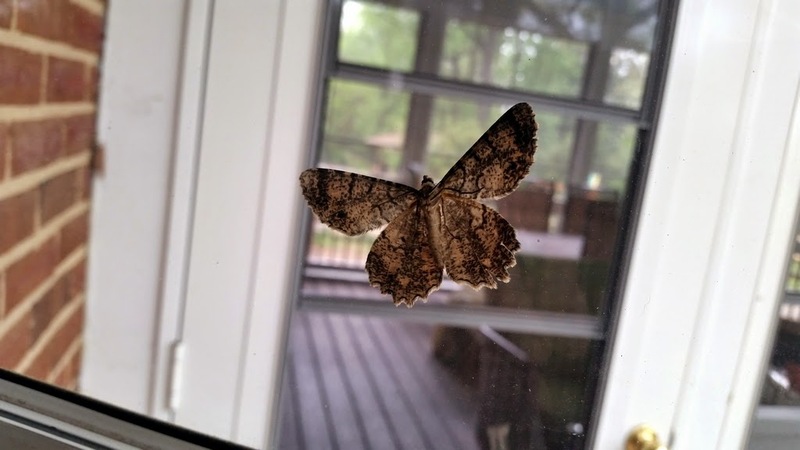 It would have blended in very well on the bark of a tree, but it apparently thought it was doing pretty well on the glass door. 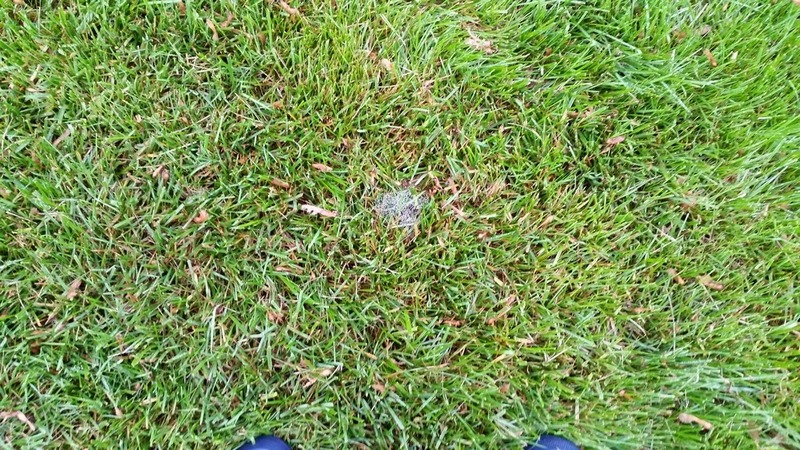 We have a pest here called the fall cankerworm that does a huge amount of damage to our trees. We are supposed to band the trees in the fall to catch the wingless female moth when she tries to climb the tree to lay her eggs. I didn't get our trees banded last fall and now we are paying the price. 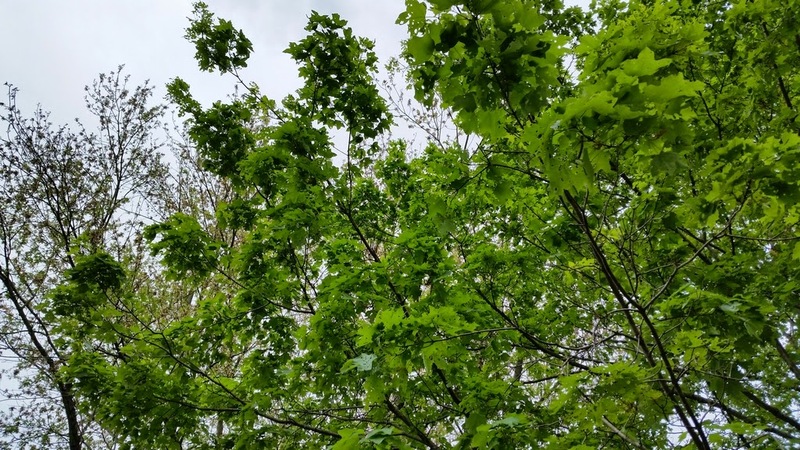 Our maple trees look like doilies and for more than a week we could here their waste falling through the leaves like the sound of rain. It's pretty disgusting. I will definitely be banding the trees this fall. One thing we have going for us is the fiery searcher beetle. It is also called "the caterpillar hunter" and we have a bumper crop of them this year. We have a large concrete pad in front of our two-car garage and some afternoons I have seen thirty or forty of them hurrying around on the concrete. And I do mean hurrying. They are always on a mission, each zooming in different directions. I was standing on the back landing trying to capture the sound of falling caterpillar waste on video when I saw one run up on the step. It stopped short when it found some prey and then pounced. Sorry about the shaky camera work, but I had to hurry up and zoom in. 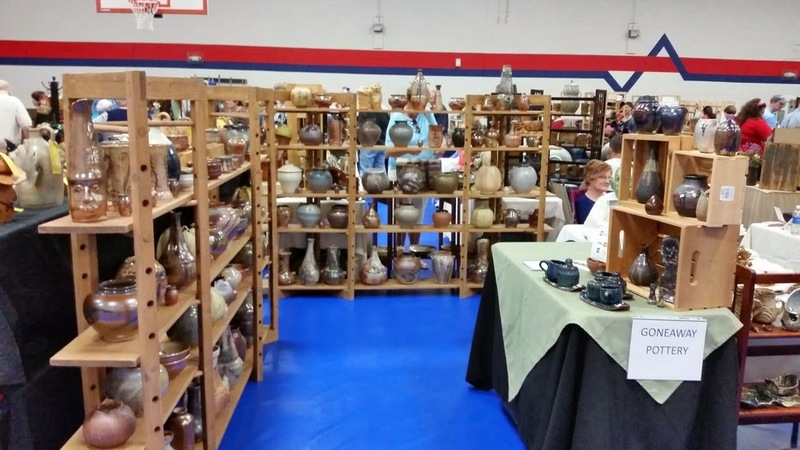 Saturday I drove to Greensboro for the Potters of the Piedmont show. It was a good show and attendance was very good. The Leonard Recreation Center is a nice location and I look forward to going back again for another show. 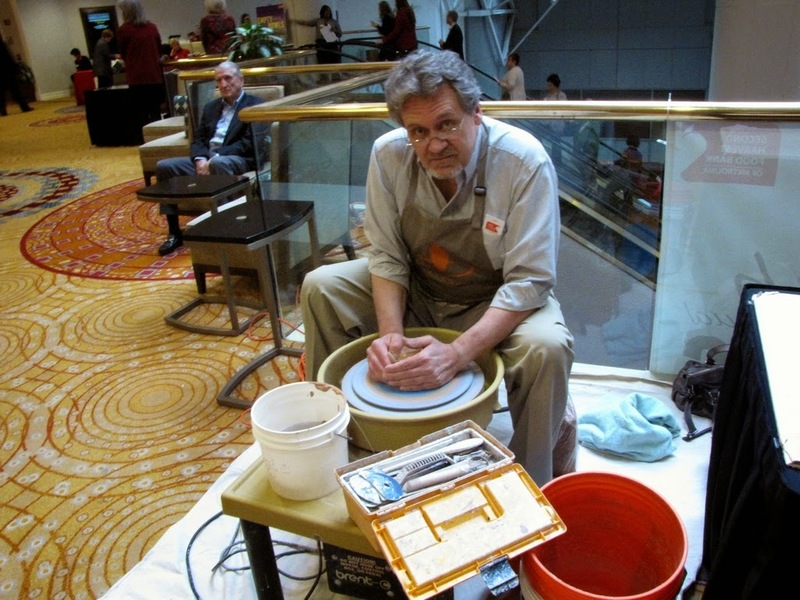 I met several nice people during the show including a couple that recently purchased one of my pots from Pottery 101. I'm definitely getting out there into the world. 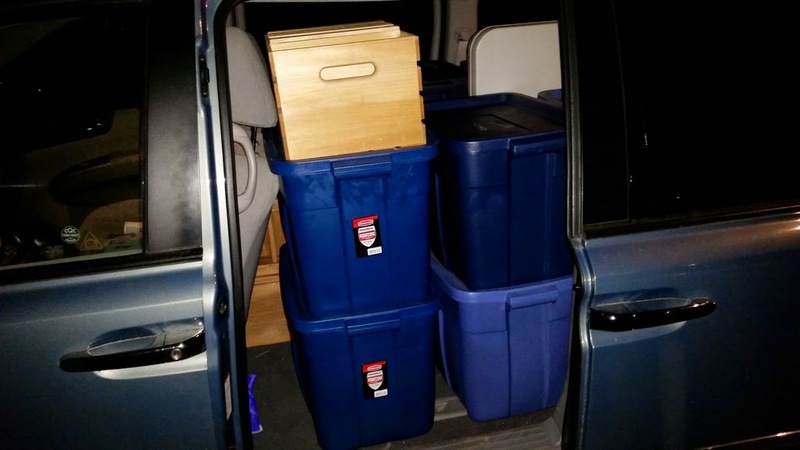 Friday night I packed the van to go to Greensboro for the Potters of the Piedmont show on Saturday. 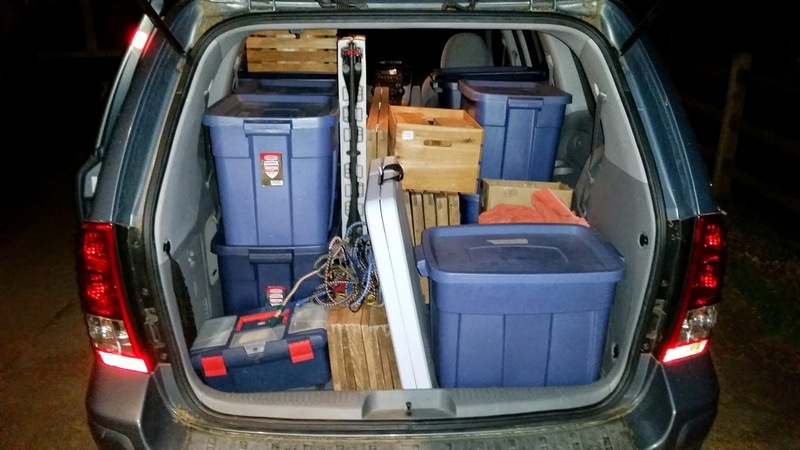 It's a full load and I have to drive almost two hours to get there. It's going to be a long day tomorrow and I ain't gettin' any younger. Wish me luck! Meanwhile the Spring continues. 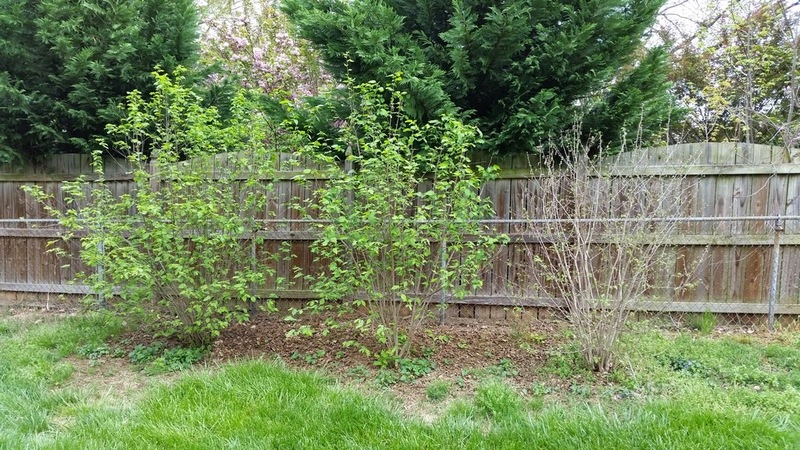 The hazelnuts are leafing out and as usual, the right one is late. 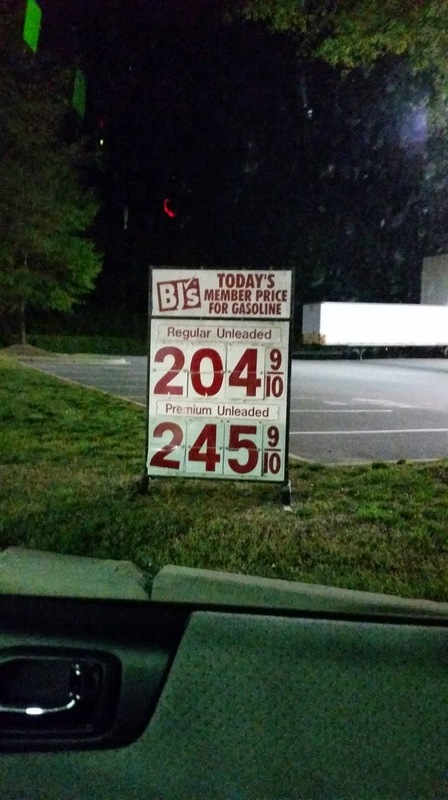 A side note: I love the current gas prices and BJ's prices are even better. I have finally finished photographing my latest pots. I am very pleased with the results. If you'd like to see them you can click on the collage below or this link. I have also changed the menu at the top of this page. 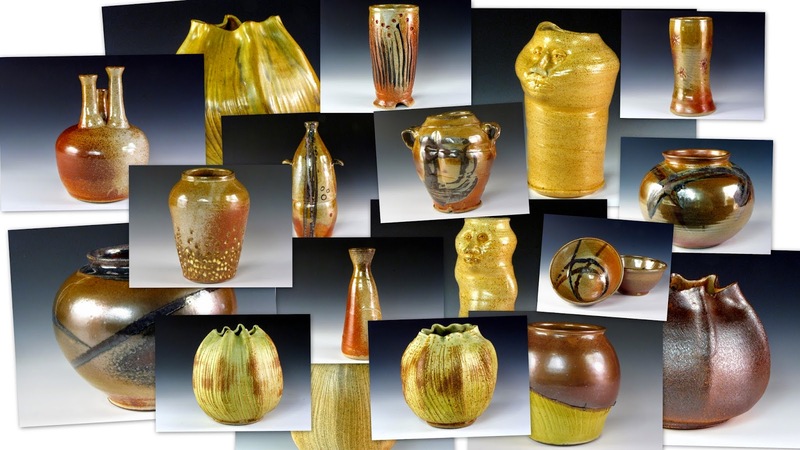 By clicking on the "My Pottery" link you will be taken to my website, which features my pottery on the "See" menu. Once there, you can review my current and previous work by firing date. Watch for more changes in 2015, including sizes and pricing. 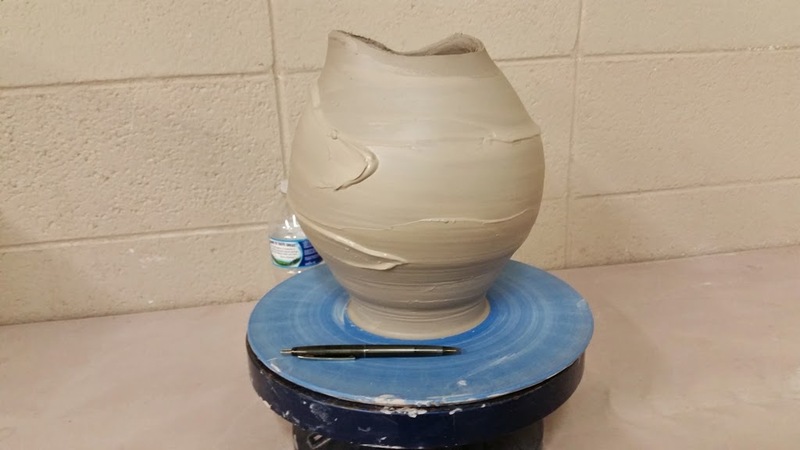 I found these photos of the Empty Bowls event on the SD card in my regular camera and thought I would share them with you. 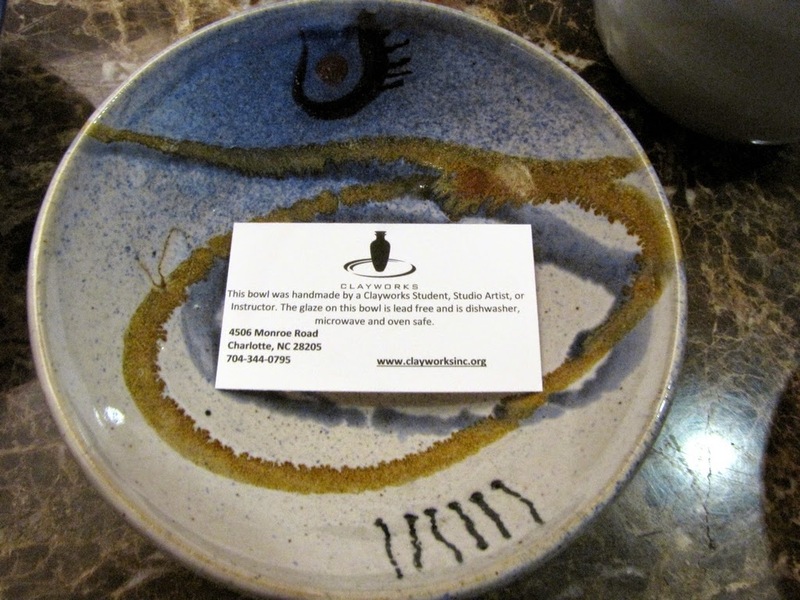 Adrienne took the one of me getting ready to demo and I took the one of my bowl with the Clayworks card in it. 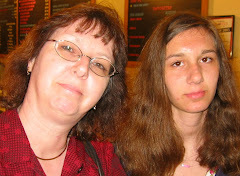 I don't know why I look so grumpy except that she caught me off guard. I wasn't grumpy when the public came in and I talked to lots of people about Clayworks and Muddy Fun. We had a good time. Two of my favorite things are demoing on the wheel and talking to people --go figure. 2015-04-06 - Monday - Over 1000 posts! 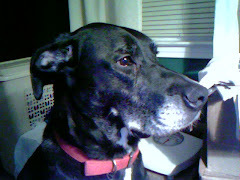 I have apparently lost track of the number of times I have posted to this blog. Today I looked over to the side of the edit page and noticed that I've written 1057 posts. It doesn't seem like I could have written that many posts since 2006, but there it is. I know people that post way more than I do, but I had no idea I had that much to say, especially looking back at my beginnings. 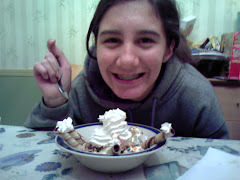 Here is the first one from June 2006. When I first started this blog I thought it would be a good way to keep family and friends informed about what was happening in our lives. It's been that and so much more. 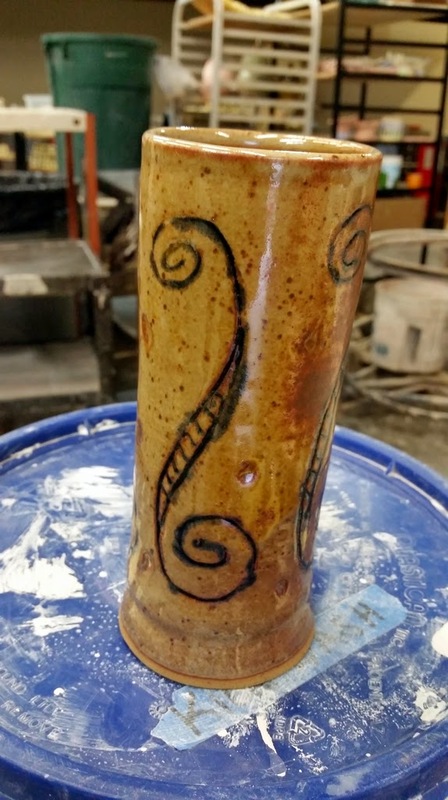 As you know I post a lot of my pottery progress here, my interesting photographs, and a lot of my observations and feelings about things. It changes constantly as my life and interests do. Wherever it's heading, here's to the next 1000 posts. 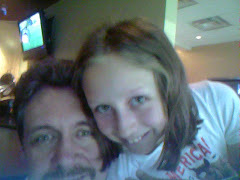 We went to visit Stephanie in her small college town over the weekend. The shopping choices are pretty limited so we ended up at Walmart for a few things. 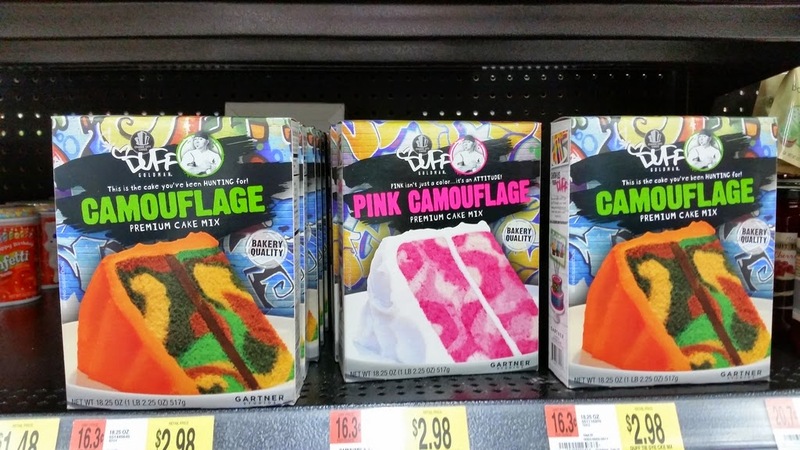 While walking the aisles I noticed these camouflage cake mixes and thought they were pretty funny. I especially like that they are "Baker Quality". 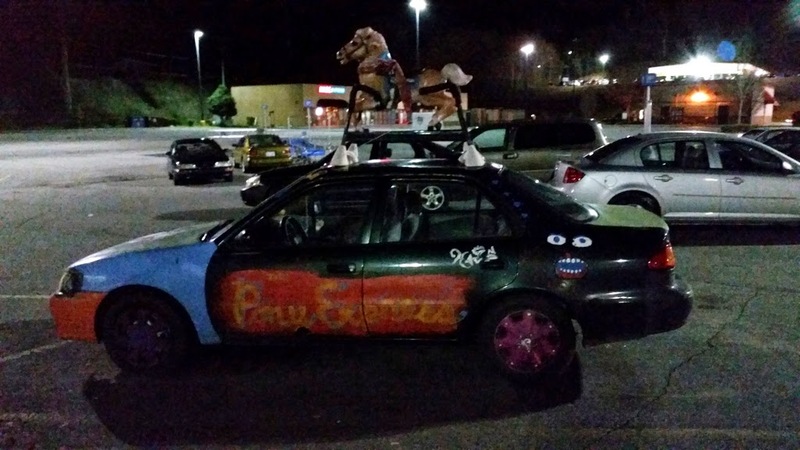 When we left I noticed this car with a rocking horse on the roof. At first I thought somebody must be transporting a rocking horse for their child, but on closer inspection I noticed it appeared to be bolted into the roof and the car was tagged "Pony Express". While I'm not sure it was "Baker Quality" I'm feel pretty sure the owners are baked. You just never know what you're going to find at Walmart, especially in a college town. I found some more fiddle heads rising in the front yard. 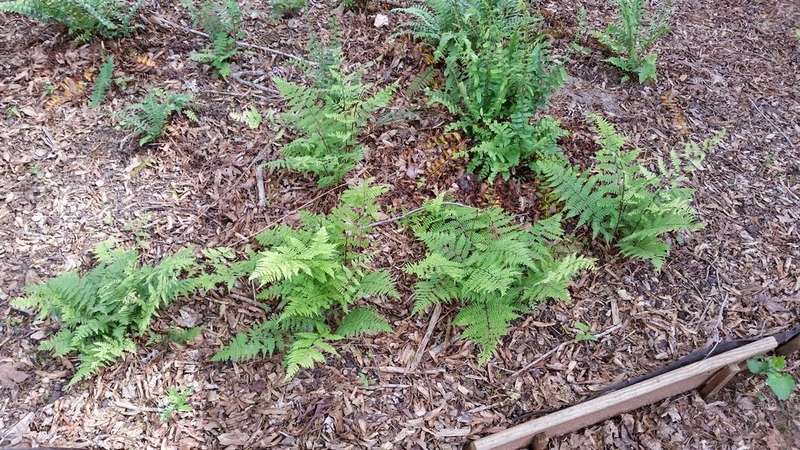 We have several different varieties of ferns and they all look different. 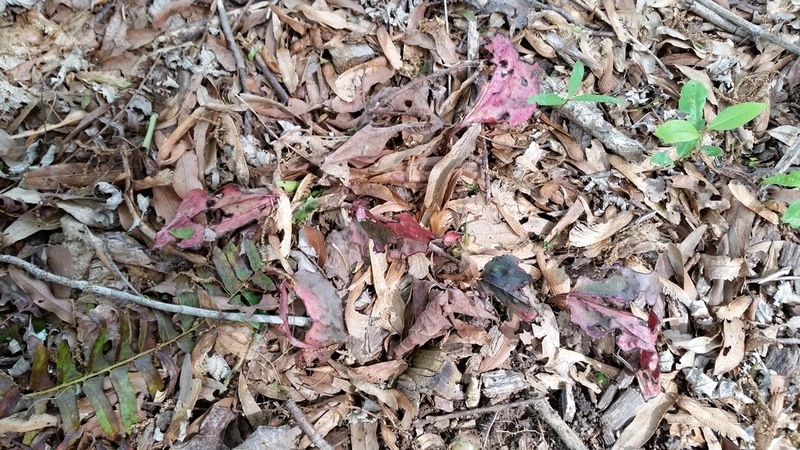 These are autumn ferns. I like the rust-colored fiddle heads on these. 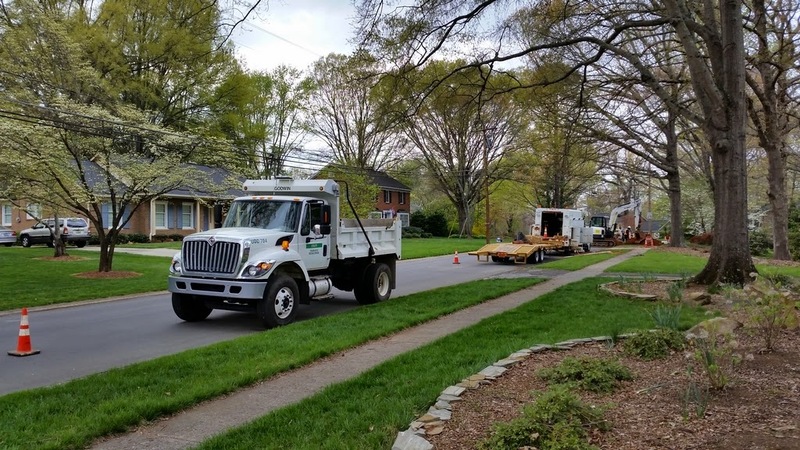 Thursday a crew showed up to repair a broken water line down the street. They spent most of the day and several hours into the evening getting it finished. 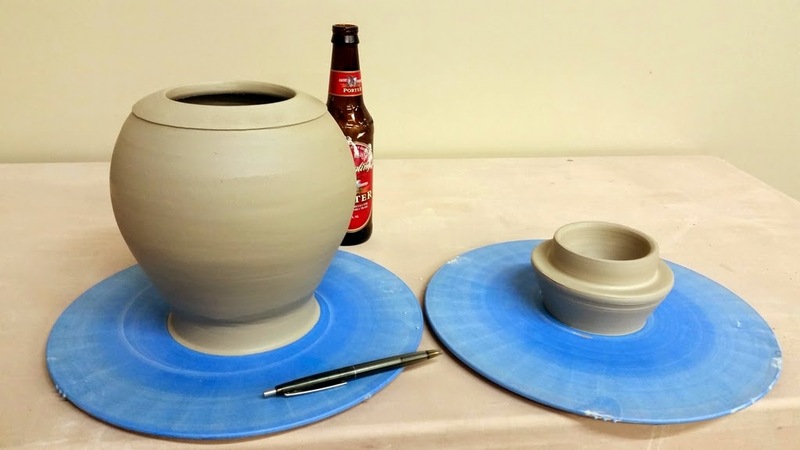 Thursday night I went to Clayworks and threw a couple of pots that I plan on modifying more later. 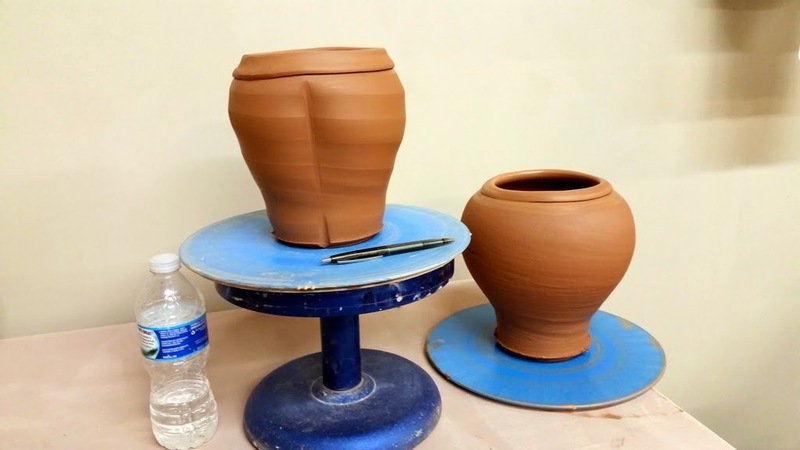 Not sure exactly what I want these pots to do yet. 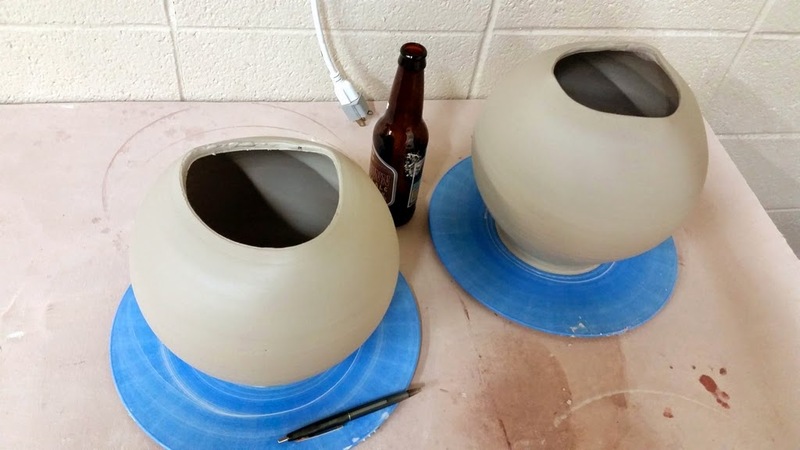 I retrieved the two pots I had in the salt kiln and was pleased with the results although I thought they were going to be a bit more toasty. 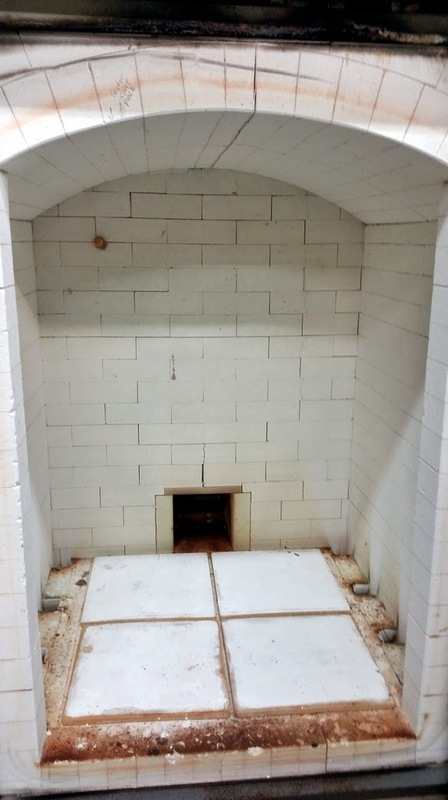 I have not figured out the salt kiln and do better with the gas reduction firings. 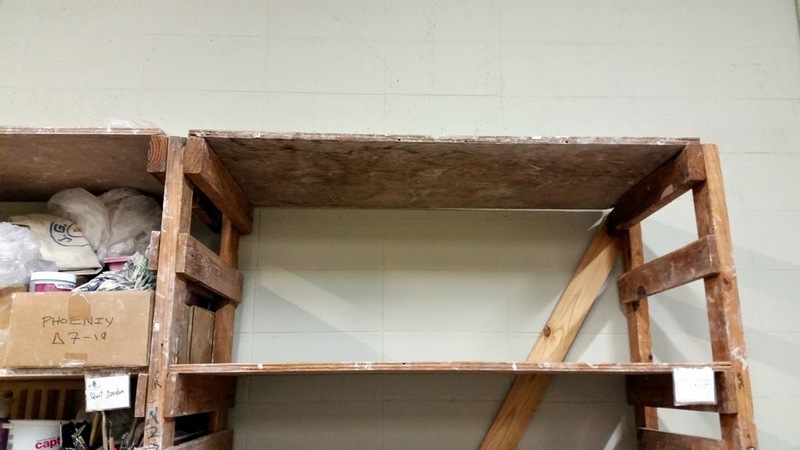 Later I moved my stuff off the student shelf and put it all back on my new artist shelves. It took four cartloads and I've almost filled my shelves already. It's amazing how much stuff I had on that small shelf. On to the next adventure. Saturday I found some more fiddle heads coming up in the yard. 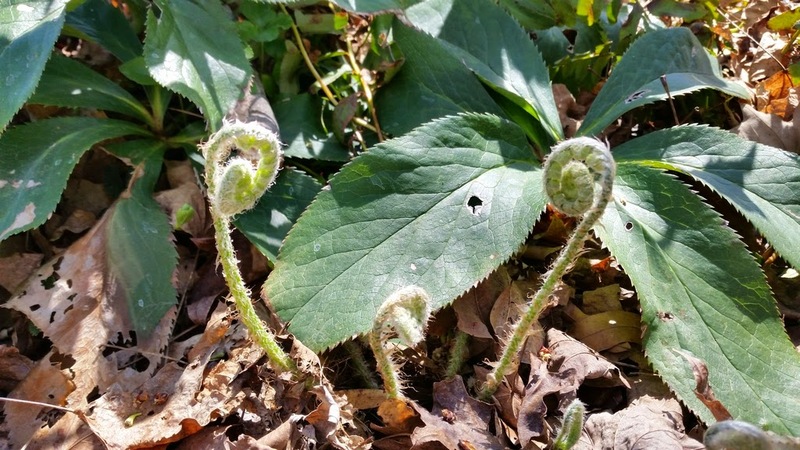 I really enjoy all the new growth in the yard, but the fiddle heads are especially cool. 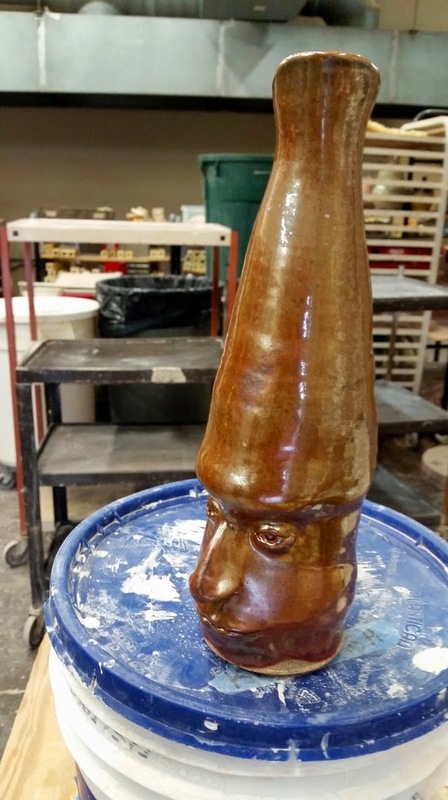 Later I went to Clayworks and made this guy. 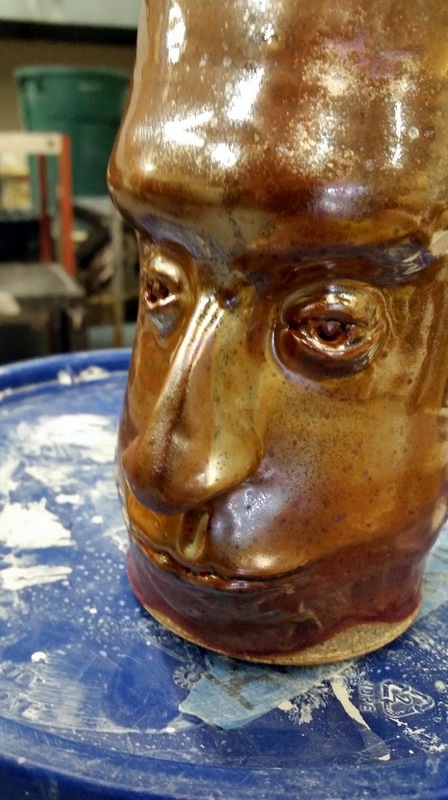 I'm enjoying playing with the proportions of the pot in relation to the size of the face. I'm going to explore this for a while... maybe. Well, almost. 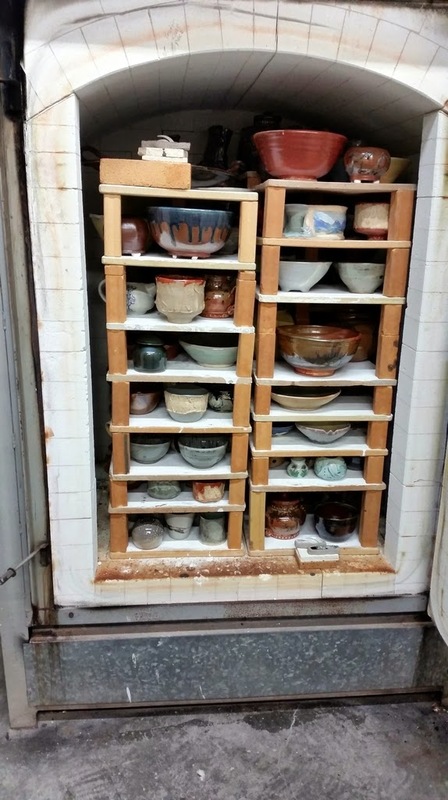 We unloaded the gas kiln tonight at Clayworks and that's always like Christmas. 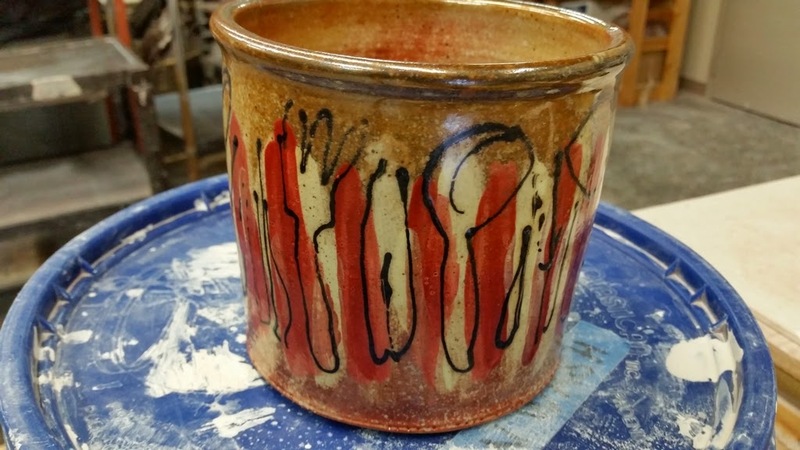 It was a good firing and I grabbed some snapshots after we unloaded, but I'll get some more "real" photos taken soon. I like to document my work. Until then, here's some wacky snapshots. A new take on faces. and think I may make more of these.